The Eaton EZ intelligent relays provide basic functions that users could only implement previously with individually installed and wired devices. The EZD multi-function displays offer powerful visualization functions. 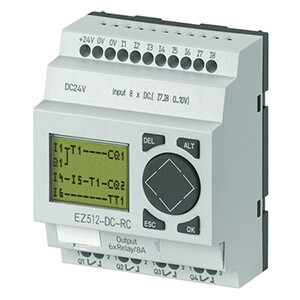 The EZ intelligent relays bring timers, relays, counters, analog functions, inputs and outputs into one compact device that is easily configured. The EZ family of products provides exceptional levels of flexibility together with substantial savings in commissioning time and effort. Other terms often used for intelligent relay are relay replacer, control relay and smart relay. The EZ intelligent relays are available in more than 20 different styles that support from 12 I/O up to 320 I/O points. Designed for use in automation for commercial & industrial sectors, domestic and building controls providing the ideal solution for lighting, energy management, industrial control, watering, pump control, HVAC and home automation. Every rung or circuit connection is wired just like you remember: Contact – Contact – Contact Coil – Done! The devices allow the "wiring" of 128 or 256 rungs of circuit connections. EZ and EZD products provide users with timing relays, flash relays, counters, analog comparators, timer switches and other ready-to-use functions. The EZSoft software is a user-friendly circuit diagram editor for the EZ500/700/800 and EZD intelligent relays. EZSoft includes an integrated offline simulation tool that allows users to test the functionality of the circuit diagram before commissioning. Simulate input switches, pushbuttons, and analog voltages. EZSoft even includes an oscilloscope mode which allows you to capture input and output waveforms in real time! The finished circuit diagram is stored internally and can also be saved externally on a memory module (EEPROM) for transport, security and backup. Multi-level password protection secures your circuit diagram from unauthorized viewing, editing, copying or deleting. 참고: Models with DC inputs also have analog input (0-10 V, 10-bit resolution) capability. EZ500 series: 2 inputs are analog capable. EZ700 & EZ800 series: 4 inputs are analog capable.